"Is there anyone who has any questions about underage females?" Not the typical way for the leader of a G-8 nation to begin a formal news conference. But this is Italy in the age of Silvio Berlusconi, the land of a flamboyant billionaire Prime Minister whose ambiguous relationship with an 18-year-old aspiring showgirl has dominated public debate for most of the month of May. Welcome to springtime in Berlusconistan. Amid the nervous laughter of his aides and reporters, Berlusconi, a Cheshire-cat grin widening across his face, brought up the question himself about le minorenni following the weekly meeting of the Council of Ministers in Rome. No, he insisted, there was nothing piccante (spicy) or "more than piccante" in his encounters with anyone underage, and he'd sworn so on the heads of his own children. 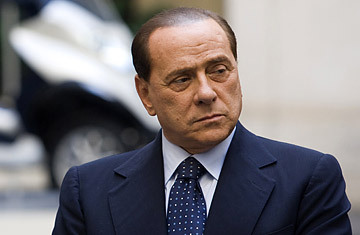 Berlusconi insisted that he would have "resigned immediately" if he had been guilty of any of the aforementioned spiciness with someone under the age of consent. That, he said, was all he would say on the matter. Which only kicked up more controversy. Some journalists say this could be the Berlusconi equivalent of Bill Clinton's "I did not have sexual relations with that woman" moment  a fact-checking challenge to investigators throughout Berlusconistan and a spur to even more debate and speculation about the Prime Minister's private life. But at the same time, the potential for scandal just might help Berlusconi keep his popularity high by giving him center stage in a public arena that ever more resembles The Jerry Springer Show (or a Fellini film). Whenever Berlusconi reaches a new high  or low  I make a point of checking with veteran La Repubblica columnist Filippo Ceccarelli. "Even if you think he's a scoundrel," says Ceccarelli, "a scoundrel creates attraction, popularity. There's a reason people go to see movies about figures like him. When the electorate is really just an audience, he continues to be No. 1."